Western Digital recently announced that it had sold 15 million helium-filled hard drives, indicating that sales of such HDDs are accelerating. Since the launch of the HGST HelioSeal platform about 3.5 years ago, it has enabled HGST to make a number of technological improvements to its hard drives in terms of their capacities. It is noteworthy that while Western Digital is expanding usage of helium, it has not announced plans to expand usage of shingled-magnetic recording (SMR). HGST, a subsidiary of Western Digital, started volume shipments of its first-generation helium-filled Ultrastar He-series hard drives in November 2013. HGST sold about a million HelioSeal HDDs in the first 1.5 years on the market, but once numerous operators of large cloud datacenters qualified such drives, their sales started to accelerate. For example, HGST supplied 1.1 million of helium-filled HDDs in Q3 2015 — more than in their first six quarters on the market. Meanwhile back in October of last year, Western Digital said it had sold 10 million HelioSeal hard drives. As it appears from the recent comments made by the company, in just a couple of quarters it has managed to sell another five million helium HDDs with cumulative shipments of such drives topping 15 million units since late 2013. “I am pleased to note that we have now shipped approximately 15 million helium hard drives cumulatively since the platform's launch four years ago,” said Michael D. Cordano, president of Western Digital, during a conference call with investors and analysts. There are multiple reasons why sales of HelioSeal-based HDDs are accelerating. First, the demand for datacenter hard drives is growing, and operators have finally qualified helium-filled HDDs for new deployments. 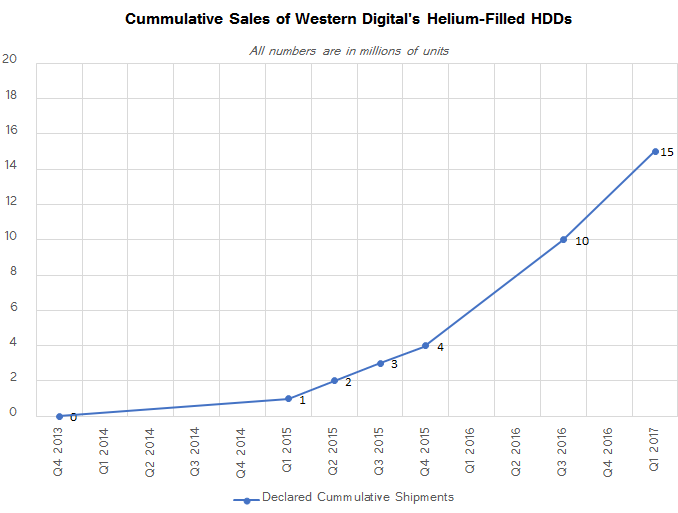 Second, with the systematic increase of drive capacities (a new capacity point is launched every 12 – 18 months), Western Digital can gradually increase shipments of helium-filled drives to existing and new deployments. Third, Western Digital is expanding usage of helium beyond datacenter-class drives to NAS and even consumer HDDs. From technology standpoint, HelioSeal has made quite a bit of progress in the recent 3.5 years. Initially, it enabled HGST to place seven platters into a single 3.5” HDD and offer a 6 TB drive, which in turn had lower power consumption and higher performance than various competitors. Installation of seven platters into one drive required HGST to redesign some of the internal HDD components, and this is always a challenge. Moreover, late last year HGST introduced an even denser hard drive, the Ultrastar He12 with eight platters, which again required the company to redevelop internal architecture of the HDD. 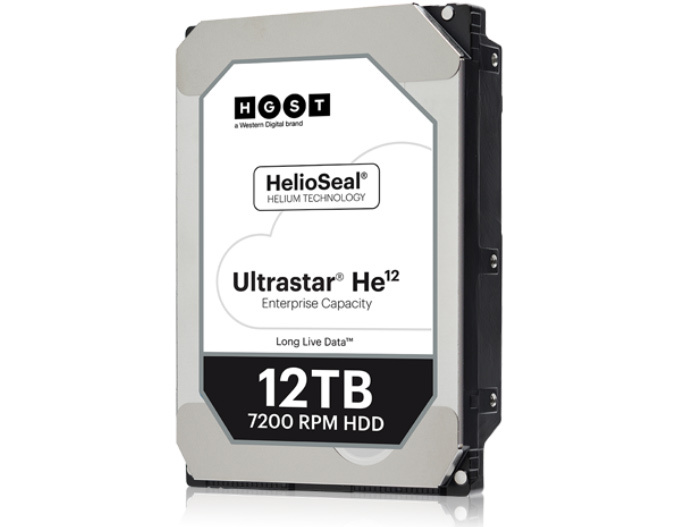 When it comes to practical progress, the helium-filled Ultrastar drives doubled their capacity from 6 TB in Q4 2013 to 12 TB in Q1 2017. By contrast, conventional air-filled PMR-based drives have not yet made it past 8 TB, increasing their capacity by 33% from 6 TB in Q1 2014. Meanwhile, if we take the SMR-based Ultrastar He12 with 14 TB capacity into account, then the progress will seem quite impressive as well (a 75% increase from 8 TB in August 2013 to 14 TB in 2H 2017). Speaking of SMR, it does not look like Western Digital is eager to share its plans regarding usage of the technology. Unlike drive-managed SMR HDDs from Seagate, SMR HDDs from Western Digital should be managed by hosts and are therefore used only for active archive/deep-archive applications that can support it. This reduces their addressable market, but the company still sells plenty of them: 20 – 35% of data stored today belongs to the two aforementioned categories. Meanwhile, Seagate offers drive-managed SMR-based HDDs for both consumers and datacenters, something that Western Digital does not. For the time being at least, it looks like the company is not planning on disclosing any kind of roadmap for drive-managed SMR devices.